In this edition of the Macworld Podcast, I interview comic-book writer Greg Pak. In addition to being the brain behind Marvel Comics “The Incredible Hulk” and, more recently, “Astonishing X-Men,” he’s written “Vision Machine.” It’s a free, Creative Commons-licensed three-issue comic series with a lot to say about how the march of technology will affect the future of our society and culture. 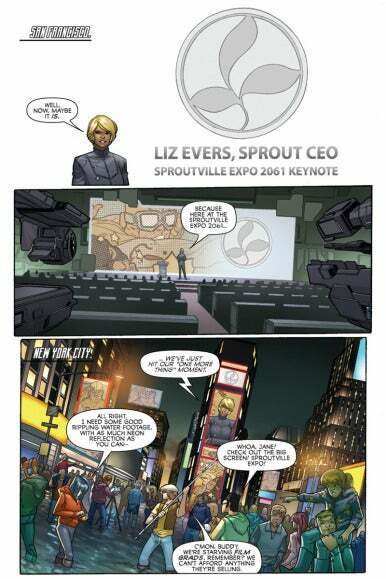 The key piece of new technology in “Vision Machine” is something called the iEye, announced by Sprout Computer at the keynote address of Sproutville Expo 2061. Pak’s vision is informed by the innovations of Apple (and other companies, such as Google) and how they’re already changing the world today. “Vision Machine” is free! You can read it for yourself by downloading the PDF or reading the issues within the Comixology app. Check out Greg Pak’s own website. Greg and I share some love for Bill Mantlo, writer of numerous influential comics including Micronauts. He’s in permanent rehabilitation since a traumatic brain injury in 1992 and his insurance has long since run out. Read more about it and donate to support Mantlo’s care. Greg’s “Planet Hulk” is great. I highly recommend it. Greg Pak also directed a feature film, Robot Stories. Have any feedback on this podcast? Christopher Breen would love it if you sent him an email; audio comments in the form of an AAC or MP3 file are particularly welcome. You can also leave us a message at 415/967-3622 if you’d like to have your comments included in a future podcast.